Ensure your lift is compliant. Update your emergency telephone services. When the nbn™ (National Broadband Network) comes your way you will need to address the problem of your emergency telephone services not functioning in the event of power outages. 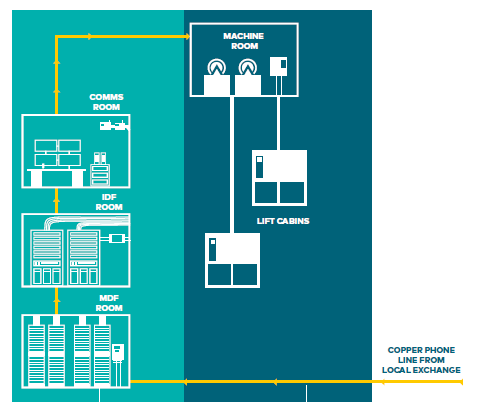 Traditional lift phones that that rely on power over PSTN line will no longer work in the case of a black out and therefore do not meet the required industry specifications. Optus’ Emergency Lift Phone PSTN Replacement powered by Pixel replaces the need for PSTN and meets the required standards. Your communications can be migrated without interruption to existing services and without needing access to the lift cabinet which can be costly. Battery back-up supply, up to 4 hours talk time with simple battery expansion if required. The unit can be installed anywhere along the yellow line in the diagram, ensuring a quick and easy install without the need to access the lift cabin. 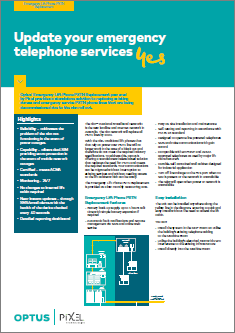 A standalone solution to replacing existing duress and emergency service PSTN phone lines.